Insecure Writer's Support Group: What's Your Book About? a brief summary or general survey of something: a synopsis of the accident - an outline of the plot of a book, play, movie, or episode of a television show. Most of us will agree that writing a synopsis is one of the hardest things a writer will ever have to do. Try to described your child in three sentences or less. A daunting task. We write the synopsis because we understand we have to sell the manuscript to a publisher who in turn needs to entice readers to buy the book. But is that the only reason? 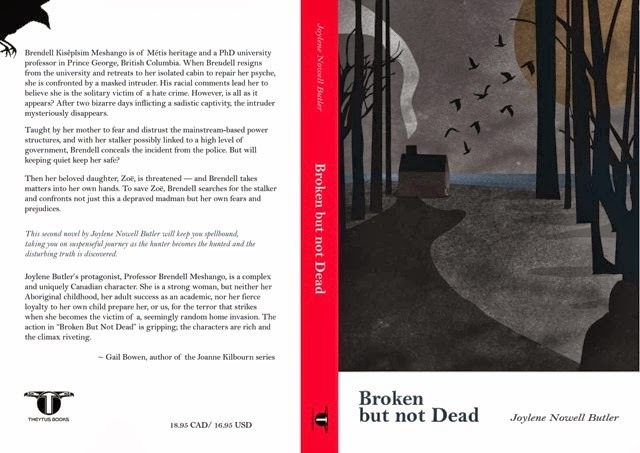 Several years ago, on the eve of Dead Witness's release date, I set about writing the synopsis for my 4th manuscript and subsequent 2nd novel Broken But Not Dead. Having spent years agonizing over the synopsis for Dead Witness, I was determined to nail the next one partially to prove I could, but mostly because I needed to understand why I write the books I write. If I could summarize any plot in its best light, I hoped I could learn something about myself and subsequently become a better writer. At the birth of each new book, I meet a protagonist who is not me, but still a reflection of my changing ideals, dreams, and fears. As I learn their story, I recognize the evolution of who I've become. Not someone necessarily smarter, but more polished. Like a rock on the beach. Enough wind, and the waves are able to smooth away more of my jagged edges. Canadian wife and mother, witness to a double murder in the States, has her life torn asunder when the FBI kidnap her so that her family and the men hired to kill her, believe she’s dead. I had to step outside myself and discovered why I'd written Dead Witness. I already knew it started with the question: What if? What if I disappeared and my brother didn't believe I was dead? But that led to: Can children survive without a mother? Can a mother survive without her children? My first manuscript, Always Father's Child was a bid to keep my dad alive. I understand why I wrote that book, and I understand why it will never be published. I know, never say never. I learned through the process of writing a full length novel that I was destined to be a storyteller. I have this overwhelming need to write about characters I'm drawn to. The story becomes their story. Their questions. In the end, they teach me about fighting demons, about the valuable of life, about myself. English professor, Metis Brendell Kisêpîsim Meshango is being stalked by the two deranged sons of a powerful politician. I have nothing in common with this woman. When I was fifty I too wasn't willing to sit back and let my life continue without direction. I felt compelled to reevaluate what it was I really wanted. Just as Brendell does in the opening scene of Broken But Not Dead. She goes off to her cabin at Cluculz Lake to reassess her life and to make changes in her career. I wrote Broken But Not Dead because I wanted the world to know that 50-year-old women aren't dried up and useless. No! In fact, they're everything Andy Rooney said -- and more. Then why did I write the sequel: Omatiwak: Woman Who Cries? (not yet published) What connects me to 60 year old Sally Warner, widow, mother of two dead sons, a woman who believes she's losing her mind? No wonder they say writing is a solitary, private, personal journey. I'm not sure I can voice those answers at this time. But even so, understanding the answers has made me a better writer. Marketing aside, the most important reason why a writer needs to write the synopsis for their book is because they owe it to themselves to truly understand the story. The essence of it. Its origin and conception. Because through understanding comes wisdom, knowledge, and a better writer. When someone asks, "What's your book about?" it's your obligation to you and to your reader to know. I can sum up a story in one line, but the full back cover synopsis is really difficult. It usually takes me a while to get the one-liner just right and the back blurb. I think a continuing theme in my novels is that there are many ways to be a hero or heroine. One doesn't have to be an action star. When a rhyming nut for the kids books I can do it easily. The novels sure take more time. I used to dread writing a synopsis, but I've grown better at it over the years. It would be interesting to write one before the book is done as a kind of road map. I agree with you that we need to understand our story because we do it justice by writing through it. They can be tricky to nail that's for sure. Some interesting thoughts here, thanks. If we can't sum up our own story, we're in trouble. Ah, we women in our fifties, eh? An interesting post that I enjoyed reading. Good luck with your writing. Sometimes we're too close to our work to easily boil it down to that log line, that answer to the, "Tell me about your book." that we all get asked. I have some good writer friends who I send 50 to 100 words. They help me boil it down to it's essence of 20-30 words. I start with a log line before I write,(not the longer 1-2 page synopsis) but by the time I've written the book, that has expanded so much, I can't get back to the original. Thank heavens for writer friends. Great post. I find writing synopses incredibly hard, but I reach out and seek the help of my writing group. They're brilliant! Funny that I find helping others with their synopses much easier than doing my own. Love this post! A synopsis can be hard, but I agree that we owe it to ourselves to understand the book and characters. It also helps us figure out if there are weak spots in the plot. I can easy talk about my book and tell people what it's about, but writing it down for promotional purposes is harder for me. Most of the time, I can't just write what I usually say to people though I haven't figured out why. I have issues with terminology that often slips me up: synopsis, blurb, description, tagline, slug, catch phrase, teaser, pitch...Great post, BTW. Really get's you thinking. @Alex, love to hear what you come up with. @Susan, your theme sounds appealing. @Pat, interesting to know. I can see why tho. @Joy, thanks. I'm with you about writing it as a road map. @Suzanne de M, yes! Go girls! @Lexa, I had great crit partners helping me too. @Marsha, I took Alex Sokoloff's online course, and wow, did it help. She's amazing. @Christine, that is so true. I'd go so far as to pay someone to write it for me. @Sara, thanks! You so get it. Hi Joylene .. I need to come back and re-read this and take it in. Synopses, one liners are 'incredibly' difficult for some extraordinary reason ... especially as Diane says we really should know - it is our work after all! Joylene, I was so glad to know that other writers wonder why they write that particular story. When I wrote Sunshine Boulevard, it was supposed to be, and is, a fun mystery story, but I was stunned when my publisher classified it as a horror story. Why could I write a horror story? THAT's the scary part for me.!! Sometimes we only realize at the end of the project why we wrote the book when we discern the theme of it. Thank goodness for my writer's group who helps figure out a logline and synopsis. The author has difficulty condensing all those pages into a few paragraphs or lines. Great post. Thanks for sharing. It's really hard to write a synopsis if you have something like a novel. It's hard for me to write a synopsis for even a short story. I was able to use the synopsis from my query letter as the blurb for my first book, but I do agree that writing a synopsis of normal length can be a...well, you know. Strangely enough, while it took me almost a month to hammer out a normal synopsis and a query synopsis for my first book, it took me but an hour to hammer out both synopsis' for my novella. Great post! I always start with a one line summary of 20 words or less when I'm done writing my manuscript to make sure I know what it's about. If I can't do it, I'm in trouble! Yay to the "I Was Seeking Gary", dedication site. Thank you for being here, my celebrity friend. It is seems your synopsis is also a bit of delving into what makes you tick. Not suggesting you are a clock, or anything. A very thoughtful posting, Joylene. @Janet, thanks for your continuing support! @GB, sounds like you've mastered this most difficult of chores. Good for you. @Jamie, I know exactly what you mean. @Gary, my fine fellow -- thanks!